O/T — kenneth foster’s "tex-a-cution" averted — at the last minute! has been commuted to life without parole. 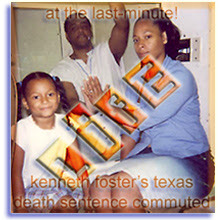 . .
foster was no angel, but he was no murderer. state-system of the mid-1990s. . .
notions of decency and ordered liberty.